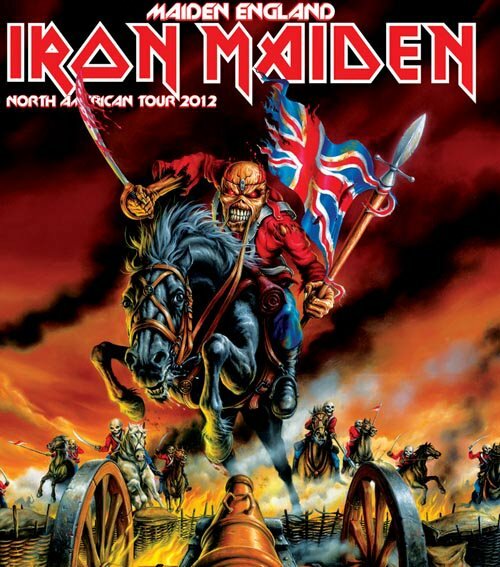 Iron Maiden have announced their 2012 North American tour. The MAIDEN ENGLAND WORLD TOUR hits the U.S. and Canada, opening in Charlotte, NC on June 21, and finishing in Houston, TX, on Aug 18…to be followed by further dates around the World in 2013. Maiden will be playing with special guest Alice Cooper to July 21, and then Coheed and Cambria join the tour. This opening section of the World Tour is the band’s most extensive visit to North America for many years and includes a number of cities the band have not played in a very long time, such as Charlotte, Atlanta, Buffalo, Indianapolis and Salt Lake City. In most venues, tickets will go on sale on March 2 and 3 – check your local ticket source to confirm plans in your area.